It’s that time again, and I am seeking re-selection by the local Labour party as one of the Labour candidates for Forest Gate North. 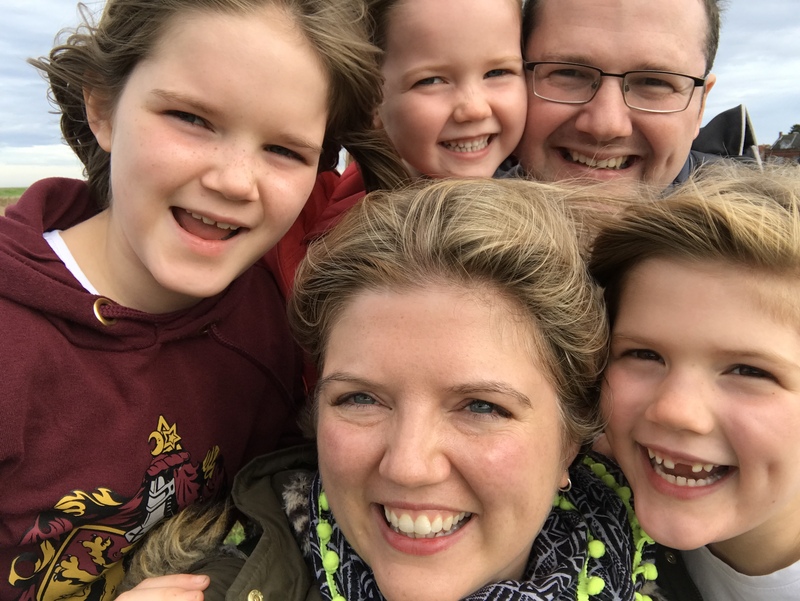 I wanted to write a blog post about why I’m hoping to be re-selected, about what re-selection means, and also what you might be able to do to help, if you would like to. (With apologies to those reading who know this process inside out already!) The local election is coming up in Newham in May 2018, which is when all residents in Newham will vote for their local councillors as well as the Mayor. Before that election, the Labour party has to choose who will be the three Labour candidates for each ward. Reselection is in several stages, rather like a job application. First you submit an application form, then you may be invited to an interview. After this if successful you are on ‘the panel’, then each ward in Newham meets individually to choose the candidates for its ward. These meetings are scheduled to take place on the weekend of the 24th and 25th February. I’m on the panel, meaning that I am currently contacting local Labour party members asking them to select me as one of the Forest Gate North candidates. More recently I set up Forest Gate Rocks, which aims to spread a little bit of painted joy around our streets and to entertain children and the young at heart, I help out when I can with the Newham Woodcraft Folk by teaching the children singing, and I am jointly with others establishing Newham Living Streets which aims to promote and encourage walking. In my free time I love reading, interiors, am a hilariously amateur fair-weather cyclist, and am increasingly obsessed with calligraphy and handlettering. It’s hard to summarise the things I am most proud of, as almost all of the work I’ve done as a councillor has been in conjunction with other people. Sometimes I worry about this, other times I realise that actually, this is what I always wanted to be: a facilitative councillor who doesn’t boss people around or take over, but listens to people’s ideas, links them up with each other, with funding, with other organisations, with Council support and helps things to happen. I have loved working with colleagues, officers and residents to get the best possible outcome for Forest Gate and Maryland stations from the money available from TfL for public realm improvements. We have some really wonderful things coming to around our station: more planting, really high quality pavements, more cycle parking, cycle docks that spell out ‘FOREST GATE’ / ‘MARYLAND’, public art, and much more. I think that the combination here of really good officers (the transport team are excellent, very skilled and approachable), the availability of money from TfL to fund something ambitious, lots of consultation, and engaged and keen councillors is helping to deliver something that will be much better than it could have been. I am constantly advocating for residents in my casework. I receive a steady stream of casework from our surgeries but also via email, via social media, or even in the street. Whilst not all casework can feel very ‘successful’, there have been some notable highlights including when I managed to remove a barrier in the way of a woman who wanted to adopt, getting a shower fixed for an elderly resident who had been without it for 6 months, and helping a woman to get back onto the Housing Register who had been removed from it. I also endeavour (and generally succeed although there is the odd exception that wakes me up at night!) to reply to everyone. Even if I just reply to say that I can’t help, or to point someone in the right direction. I try my very best to reply to the frequent comments and messages I get via social media, as well as to emails, and to chase up answers from others when I am ignored or fobbed off. I’m not perfect, but I am generally really organised, persistent, polite, and assiduous, and I think all these qualities make me good at casework. Parking is, as I always joke, not my favourite topic. But it is important to residents, and it’s an important part of what the Council does, and hence I have become an unwilling expert in parking retrictions, and spent some considerable time responding to emails and petitions, visiting residents, and visiting roads where specific bays or designs were problematic. I insisted on, and then held a drop in meeting for residents when the RPZ was introduced, and dealt with a lot of very strong feelings on the topic that night, but still feel it was important to speak to people face to face. Together Seyi and I published several very detailed and open blog posts about the RPZ process, about the constraints, about the full results of the consultation question on the hours of operation, and found that by being entirely open with residents we could help to reduce some of the uncertainty and suspicion about what was happening and why. On a related parking note, when Centre Road was filled up with cars, which was unsightly and inconvenient but more importantly unsafe, I assiduously lobbied Redbridge Council (who are responsible for this road, though it neighbours our ward) and am delighted to say that they introduced parking controls before we had any serious accidents there. I’ve always tried to develop good relationships with the organisations and people who make Forest Gate North such a brilliant place, and take every opportunity to promote our neighbourhood whenever I can. I have really warm relationships with some of the wonderful people who run many of our really special local businesses, and will always try to find ways to boost them and to promote their work. I have developed relationships with faith groups, schools, community organisations, as well as with individual residents and always aim to develop honest relationships, to do work together with others and to acknowledge other people’s contributions. Although not specific to Forest Gate North, I sit on the Strategic Development Committee, and have taken very seriously the responsibility to question developers, to demand high quality buildings in Newham, and to listen to and respond to queries, concerns and comments from residents who respond to planning and come to committees. It is partly through this committee that I’ve developed more and more of an interest in public realm, in architecture and design, and in sustainable transport especially including cycling and walking. I have just blogged along with Seyi with a full update on this project, so you can read all about it there. Seyi developed and took the lead in Thorogood Gardens, but I’ve had so much pleasure in supporting her, working to make things happen and contribute to her idea of adding lots of little things to make a big difference in one place. 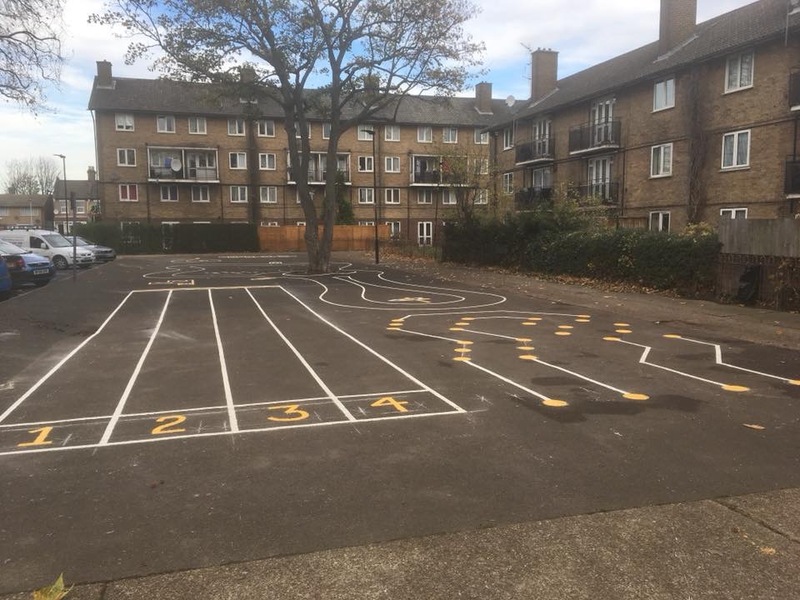 I am especially proud to see the play markings go in today – an idea which genuinely just occurred to me as we were visiting one day, as a way of making the most of an unloved bit of tarmac. With some support from Hochtief, this has now been transformed into an area that encourages children to come out and play. Licensing, though it can appear dry, is one of the main powers that a local authority has, and is a vital part of what councillors do. During my time as a councillor I have contributed several times to the licensing process. This has included submitting evidence and attending hearings to support applications from local businesses and organisations like CoffeE7, Corner Kitchen and Woodgrange market, but also submitting evidence and attending hearings when licensed venues were causing residents disruption and distress. Most recently I attended a magistrates court for a hearing (sadly deferred to December) to hear the appeal from an extremely troublesome venue that has consistently opened beyond its permitted hours, has caused a persistent nuisance with noise and disturbance, and at one point was so out of control that the licensee claims he was imprisoned in the venue and the police were called. During my time at Newham, I’ve been a Mayoral Advisor and a Member of the Cabinet. As lead councillor for Forest Gate, I oversaw the work happening at the Gate library. During that time I constantly tried to make the work we do locally more open and more collaborative. For example, instead of carrying on with the general networking meetings at the library, I instead organised themed events around parts of our local community plan, like the environment, an artists’ networking meeting, a meeting to bring together local business owners, and a joint meeting with Newham Cyclists aimed at encouraging people to cycle. 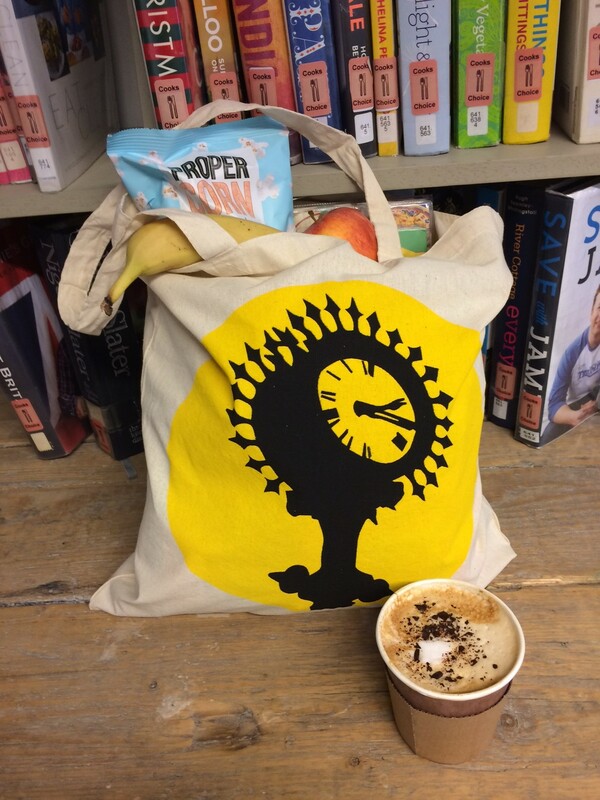 I was especially proud of the work we did last year for Small Business Saturday, where we were supported by the Newham Regeneration team and printed shopping bags which were offered to people who made at least three local purchases. Requiring people to get three different coloured stickers to qualify encouraged people to move around the whole of Forest Gate, including Upton Lane, Woodgrange Road, and the market. I subsequently became Cabinet member, first for Equalities, and then also for Transformation (overseeing in particularly the digital improvement that is happening – watch this space for much better information online about homelessness, and a better online system for parking permits) and also for the Council Services to Small Businesses portfolio, sometimes abbreviated to CSSB. This is the process by which Council services are ‘spun out’ into Council or employee owned businesses, which can deliver services in a better way, and get business from outside of Newham. Amongst other work, I was very pleased during this process to oversee the preparation for externalising ‘Juniper Ventures’, which provides many schools’ catering and cleaning, and also (very unusually for this sector) pays all its employees at least the London Living Wage and invests in their training. Right now, I’m no longer on the Cabinet, and am just concentrating on my ‘back bench’ work for Forest Gate North, having resigned from in September of this year. 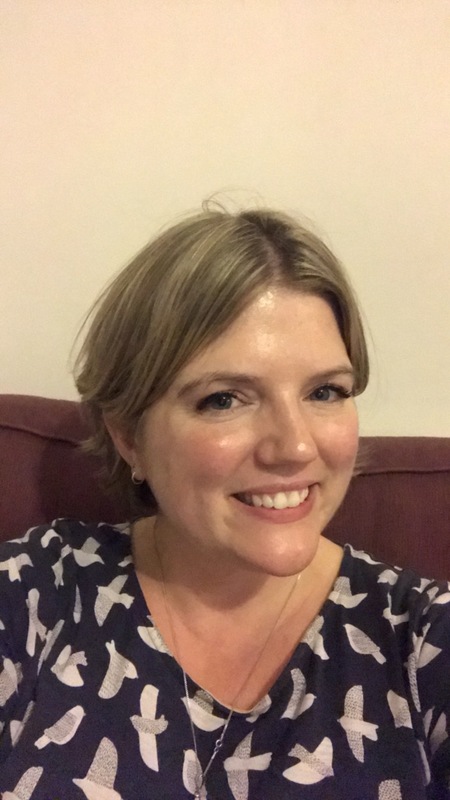 Although I’d really enjoyed being part of the decision-making process and feeding into borough-wide work, there were some things I did not agree with and for various reasons I decided I needed to step away from that part of my work. However, I did gain some very useful experience, learnt a huge amount about how the Council works, and made many very useful contacts with people inside and outside the Council. This experience and these contacts all help me in my local work going forwards. Before I became a councillor I worked in the public sector, first in health regulation and then for the London Borough of Islington. I have worked in communications and then increasingly in policy and strategy, including equalities. I’ve done lots of writing in my professional career, and have spent a long time trying to make complicated work and ideas straightforward and accessible. My work as an officer has I hope given me a good insight into what it can be like in a local authority, and I feel that this helps me to be a good councillor, being both sympathetic to the pressures council employees are under but also ambitious for improvement, robust in calling out things that need to be different, and appreciative of and vocal about things that are going well. I have so many ideas for the future of Forest Gate, and it is primarily these, along with the relationships I’ve built, which make me so keen to stand again. – carry on supporting local businesses, and see if we could help support a local business association or group, with a view to eventually establishing a business improvement district. – encourage more ‘greening’ of Forest Gate, particularly by maximising the green space we have by improving the many, many small unloved areas that still exist even in a place as urban and populated as this one. There is so much potential here, not just with the amazing community garden (outside the ward, but doing such good work with such a great reach that they are really important to residents of Forest Gate North too) but also for more guerilla gardening, for encouraging resident gardening like that which is taking place in Thorogood Gardens, working with schools, and more. – insist that Keep Newham Moving, which has already improved many of our roads in the ward, takes full advantage of the opportunity we have to change our environment in line with Sadiq Khan’s Healthy Streets policy. When we resurface a road, we should be constantly assessing whether we also need traffic calming, additional planting, to widen the pavements, additional facilities for cycling, or anything else that can make our streets more pleasant places to be. – carry on supporting my colleague Seyi Akiwowo in her tireless efforts to bring people together to tackle the issue of youth safety along with our local police force. Our young people are being hurt and in some cases killed on our streets, and ensuring their safety and their ability to participate in and influence their local area is one of the most important things we can do as councillors. – do something to improve local understanding of the planning process. I had previously tried to organise a meeting when I was lead councillor, and I’d like to come back to this. Planning and development can be contentious, but if we have real input and feedback into the developments that are proposed then this helps to strengthen planning officers’ hands in getting the very best for our area. Even more important, but perhaps even less accessible, are the planning policy documents that form the basis on which planning decisions are made. I would love to help find a more easy and meaningful way to get input on these from Forest Gate North residents. There is lots more I’d like to do! I am happy to talk more if you are interested. The above is just what I’m interested in, and if reselected I’d like to do more listening to residents about their ideas for Forest Gate North. A lot of this happens already via our conversations with people on the doorstep, when the local Labour party is out canvassing, all year round, regardless of whether an election is coming up or not. 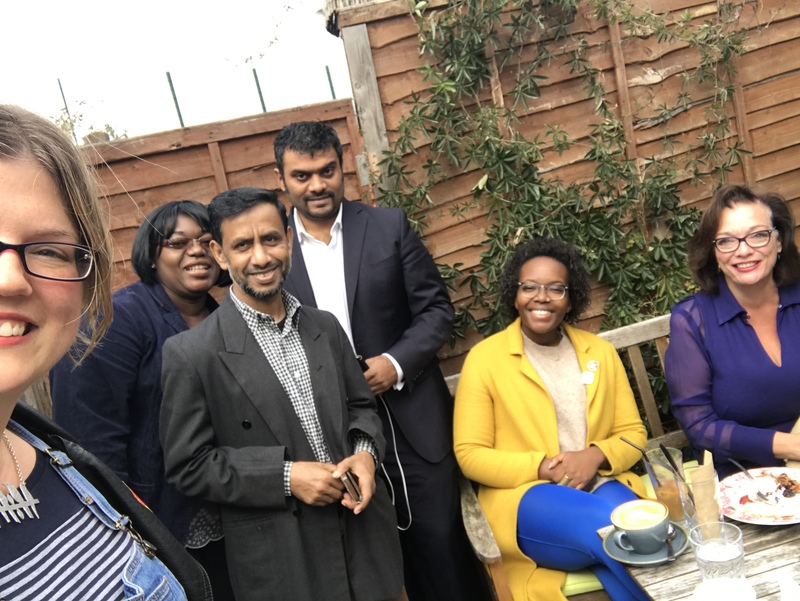 But I would like to increase the way we engage with residents and with members, including holding another coffee morning like the ‘thank you’ one Seyi, Anam and I did with Lyn Brown in Familia Cafe a few months ago. It would be great to develop a local set of priorities for local councillors, based on feedback that you give us. So, why am I sharing all this here? Firstly, as ever for transparency. I fear I’ve become a bit of a transparency bore, but I do think that it’s always important to be up front and honest. Which is why I want to be open about the fact that if you are a member of the Labour party, and you live in Forest Gate North, then I am specifically asking you whether you would please attend the local selection meeting (which is scheduled to take place on either the 24th or 25th February) and think about voting for me. If you’re not a member, you might know people locally who are members, in which case perhaps you might remind them to attend and ask them to vote for me. Whatever the outcome of this process, I would like to say – in a way that I hope is not too cheesy – that it’s been an enormous privilege to represent Forest Gate North along with my colleagues for the past three-and-a-bit years. Although I do receive a lot of complaints, queries and questions (and rightly so, that’s part of the job) I have also been extremely fortunate to receive plenty of local support. I have appreciated absolutely every single bit of it, from the wave across the marketplace, to the people who recognised me from twitter and came to say hello, from the people who were so kind after I resigned from the cabinet, to the person who sent me flowers to thank me for sorting out her casework. So wherever things end up after selections are over, thank you very much for reading this blog, and for your messages and of course for your forebearance for my overly long blog posts. I have enjoyed it very much.